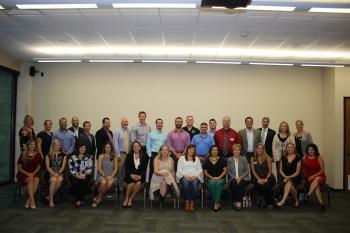 The 26th class of the prestigious Leadership New Braunfels program will graduate at a ceremony in their honor on May 1 at TBarM Retreat from 11:30 a.m. to 1:00 p.m. The 2018 class consists of 30 individuals who have met the attendance and participation requirements in order to graduate and join the more than 630 previous graduates as members of the LNB Alumni Association. The class has met monthly since October for day-long sessions covering topics such as government, economic development, social needs, personal skills and other key segments of the community. Throughout the program, participants had the opportunity to meet New Braunfels and Comal County leaders, build their leadership skills, and develop valuable relationships with their classmates. The graduation will include award presentations to the class, a buffet lunch and keynote address by Ramiro “Ray” Martinez. Martinez is an author, former Texas Ranger, Austin police officer, and justice of the peace, and one of the heroes of the University of Texas Tower sniper incident. He chose to risk his life to save others that day and his bravery going in and atop the tower ended rifle fire and the threat to potential victims below.